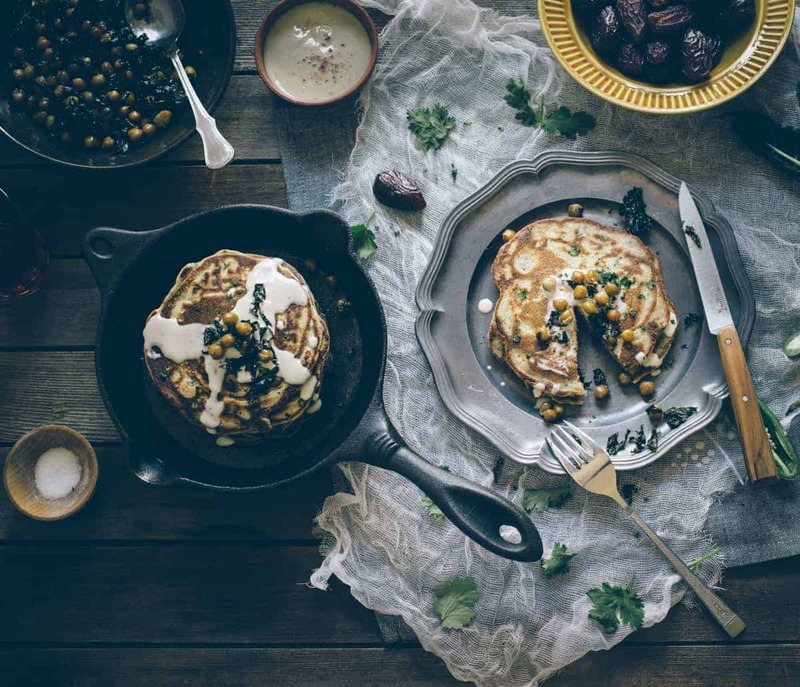 Enjoy a different kind of brunch and make these Middle Eastern pancakes served alongside some roasted chickpeas and a creamy tahini dressing. When you think of pancakes, I’m sure your first thoughts aren’t about the Middle East and its wonderful herbs and spices. Well, I’m about to change that! These Middle Eastern pancakes are of the savoury kind. They are accompanied with some roasted chickpeas and kale and topped with a lemon-y tahini dressing. As often is the case with me, I had way too many ingredients lying about that I wanted to use up. Add a can of the “way too many purchased cans of chickpeas that were on sale” and brunch is served. If you’re looking for something different than the usual buckwheat pikelets or almond pancakes, I urge you to get a batch of these on the stovetop immediately. Serve them as part of a “Middle Eastern inspired” buffet. In my little soirée I also included fresh dates and mint tea. They’re filled with freshly chopped spring onions, coriander, cumin and sumac. I’ve also used a combo of spelt flours as my choice of flour but you can always use the regular kind. No stress! So what are you waiting for? Get in the kitchen and make these and serve them up for a very different kind of brunch. Scroll down for the Middle Eastern pancakes recipe. Preheat your oven to 190 deg C. Combine the chickpeas, kale, olive oil, sumac and salt and pepper in a bowl. Stir to combine and then place the mixture in a roasting and bake for 20-25 mins until the kale becomes crispy. In a separate bowl combine the spelt flours, spring onions, coriander, jalapeno, cumin and sumac. Stir to combine. In a separate jug, combine the milk and egg and whisk thoroughly. Pour into the spelt flour mixture and stir until well combined. Add the melted butter to the savoury pancake batter and allow to rest for 10 mins. To make the pancakes, preheat your pan with a little ghee on a medium high heat. Once heated scoop out ¼ measuring cup of batter and cook the pancake on one side for 2 mins, turn over and cook the other side for 1 min. Repeat until all pancakes are cooked. Combine the ingredients for the tahini dressing and serve alongside the pancakes and roasted chickpeas.